We love our Pineapple Pups! All of our hotels are dog-friendly, so we jumped at the idea of partnering with Aurora James of Dog Etiquette to provide A Dog Owner’s Guide To Seattle. Check out some dog-friendly things to do with your four-legged friend below! Having a pet dog is one of the joys in life. There’s nothing like seeing how excited they are to see you, spending time playing, or just snuggling up together. Because you live in Seattle, there’s even more fun you can be having with your dog. You just have to know where to go — and this short guide can help you find the perfect spots. If you want to shop local, there are stores in the Seattle, WA area where you can bring your dog for a little retail therapy. Bring Fido lists many of these stores, including the University Village Shopping Center, Ballard Sunday Farmer’s Market, and the Redmond Town Center. Be sure to keep your dog on a tight leash in these stores to protect their wares from a curious bite. Seattle is home to many great restaurants and coffee bars. Now, there are places where you can take your puppy and get a tasty treat for yourself. From Norm’s Eatery & Ale House in Fremont to Nollie’s Cafe located in South Lake Union, you can enjoy a meal with your furry friend nearby. Locate your neighborhood’s dog-friendly coffee shop. Check online or in-store to verify their specific regulations on canine customers. Check that Spike’s collar fits properly, his leash is in good condition, and keep him secured throughout your visit..
Bring portable dishes to keep your pup hydrated and plastic bags for waste. Practice good etiquette and never approach another person’s dog without their explicit approval. Keep up with regular obedience training - even if your dog is an adult. 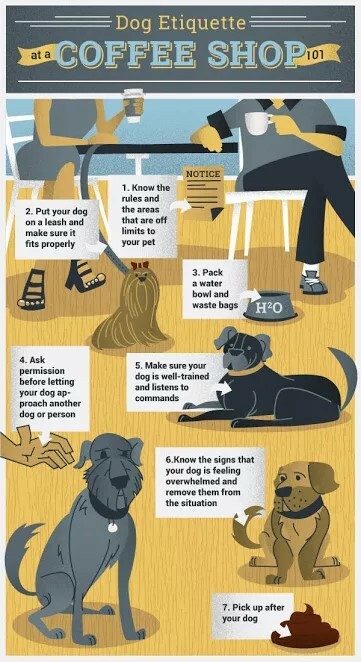 Pay close attention to your dog’s behavior and demeanor. Take him home if he seems overwhelmed. Always, always clean up after your pet. After all these adventures, your dog will likely need some grooming. Check Yelp for customer reviews of local groomers and find a great one near your Seattle home. Once complete, you might need a break yourself. That’s when you can check Rover.com to find a reputable dog walker in your area, whether that’s for right now or a walk you want to schedule for later. A great city like Seattle deserves to be explored on foot. And by picking the right places beforehand, you can bring your dog along. This way, both of you can enjoy getting out some more.